Welcome to our Town - Here's everything you need to know! Come along with us as we bring our walls to life. We've got plenty in store for visitors and artists this week, check out our schedule of events for more details. Drama Donna Stone and her troupe will perform two free performances entitled Streator Still Struts: The History of Streator through Murals and Milestones. Each performance lasts approximately one hour and audience members will walk/ride to various locations. Please consider bringing a lawn chair for seating. 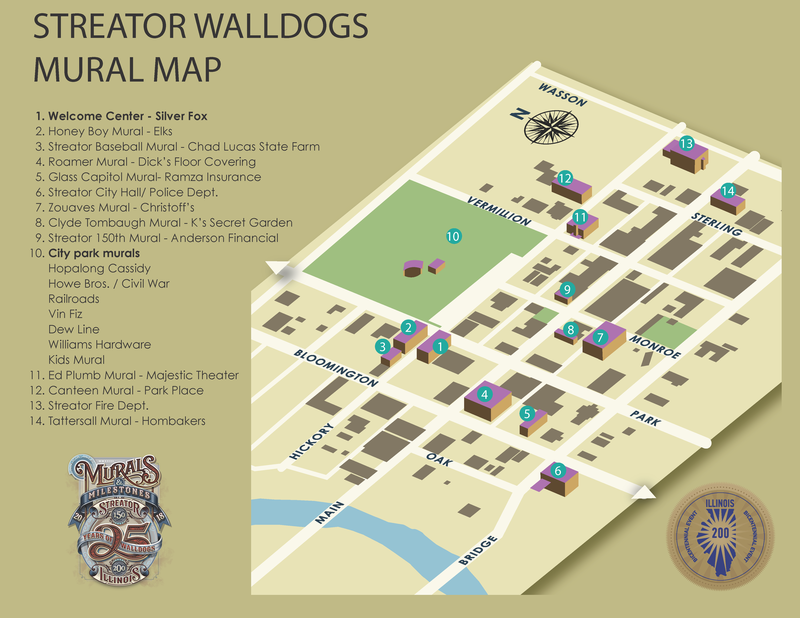 View mural and welcome center locations below. If you need to, you can download or print the map here. Need to stay? We've Got Just the Place! All local lodging options are SOLD OUT! Please contact us or see below for other lodging options.